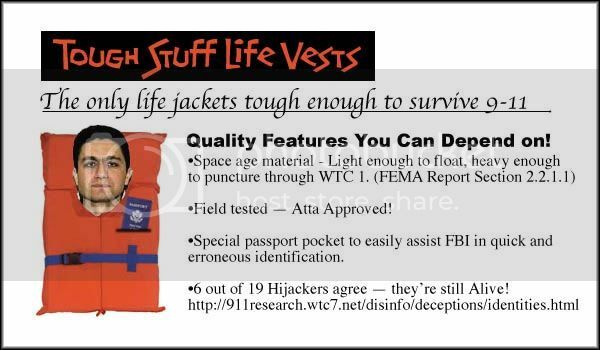 You can recreate what the real perps behind 9/11 and their lap dog media reported as happening in your backyard! Take an empty, or if you're feeling macho, a full aluminum can of soda or beer and smash it into your BBQ grill and see what happens! See for yourself if aluminum is stronger than forged steel. Word of warning! If you try this, make sure you have some sick days you can use at work, so you can recover from the sprained wrist you'll get from trying to smash an aluminum can thru a steel grill. In a violent encounter between an aluminum plane weighing nearly 140 tons and a steel tower weighing 500,000 tons, the plane, of course, would be crushed. Would wing tips and tail break off against each steel wall or disappear entirely inside each building? Ordinarily the answer would be that wing tips and tail would shear off on impact and bounce to the ground below. Wing tips have enormous forward momentum at impact but begin to decelerate as the nose and fuselage collides with a steel wall, five floors of steel-truss-steel-reinforced-concrete, and a steel inner core. This would wreak complete havoc on the plane, although the plane in the south tower videos looks like an invincible hot knife going through a soft butter tower. 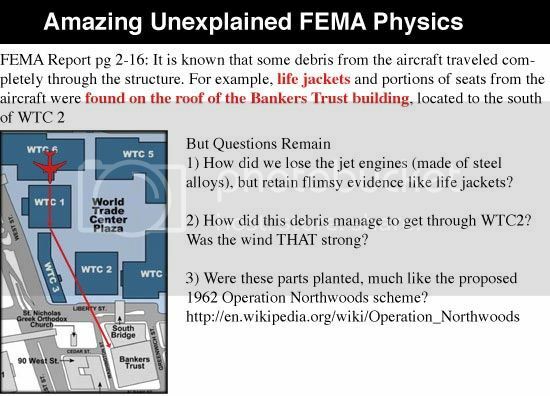 Localized force applied by the wing tips was insufficient to fragment steel columns or spandrel plates and we should have seen video footage of the repelled wreckage bounce to the ground. There are no reports of such wreckage that I can find. A decelerating tail section would slow down and break off too, yet we saw no trace of it. Maybe the SOB's that pulled off 9/11, the WH and elements of the FBI, the CIA, NSA, the Pentagon and Israel, engaged the services of magician David Copperfield on that day?